Remember that awesome smartphone controlled paper airplane we told you about a few weeks ago? The one that’s way more fun than any boring old quadcopter drone? Well, we’re about to one-up ourselves because we found something even cooler. 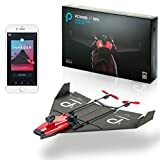 If you’re willing to shell out a little extra cash, the POWERUP FPV Smartphone Controlled Paper Airplane has all the features of the other model we told you about… but it also has an integrated live streaming camera! Trust us, you’re going to love this thing. Experience flight as if you were sitting in the cockpit of your paper airplane.